Without a Home: The National Youth Homelessness Survey is the first pan-Canadian study of young people who experience homelessness. With 1,103 respondents from almost 50 different communities across the country, the study provides detailed information about youth homelessness in Canada. This research was conducted by the Canadian Observatory on Homelessness, in partnership with A Way Home Canada and The National Learning Community on Youth Homelessness, and funded by the Home Depot Canada Foundation. 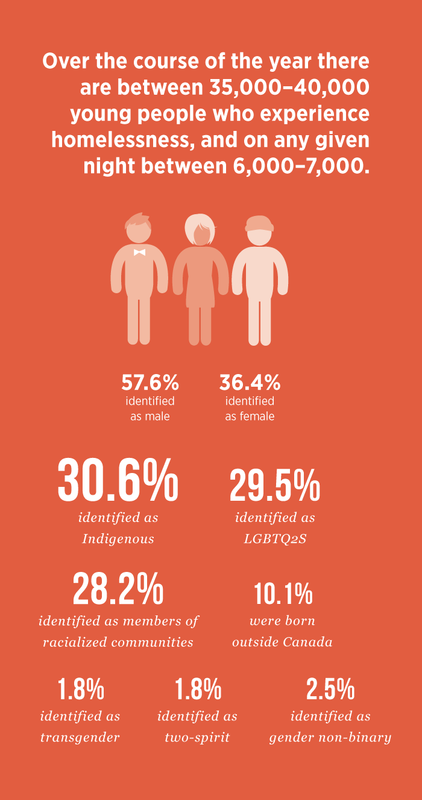 It would not have been possible without the dedicated work of 57 Canadian youth-serving agencies, all of whom actively engaged young people to complete the survey. Through a partnership between the Okanagan Boys and Girls Clubs and Canadian Mental Health Association, Kelowna, this significant survey included approximately 30 young people from our communities. Thank you to the many organizations who supported this initiative and helped us reach these young people.